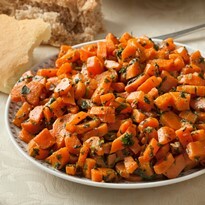 Although it's tasty when warm, this recipe is also a great healthy side dish to make ahead. The flavors develop more as it chills in the refrigerator. Steam the carrots until just crisp tender, about 6 to 10 minutes. Remove the carrots to a serving dish. In a small bowl, whisk together the oil, vinegar, parsley, cilantro (if using), garlic, cumin, mustard, pepper, and salt. Pour the dressing over the carrots and toss to coat. Serve warm, let the flavors meld for an hour at room temperature, or refrigerate for several hours to overnight.